For PRTG on premises instances, you can log in to the web interface once the PRTG core server is installed. In your browser, load the IP address or DNS name of the computer PRTG is installed on and log in using the Login button. For PRTG on demand instances, open your registered PRTG on demand domain and log in to the web interface. In a web browser window, please enter the IP address or URL of the system PRTG is installed on. When using a cluster, please connect to the primary master node. You can also double-click on the PRTG Network Monitor icon on the desktop of the system PRTG is installed on. If you are using PRTG on demand, enter the URL of your instance, for example myfirstdomain.my-prtg.com to access the web interface with a supported browser. This only applies to PRTG on premises instances, not to PRTG on demand. Login: Log in to the fully featured Ajax web interface which is the standard interface. We recommend that you use this option for PRTG whenever possible. It offers the full functionality of PRTG. Use Google Chrome 57 or later (recommended) or Mozilla Firefox 52 or later for best performance. In some browsers, the Ajax option is not shown, for example, in old browser versions. 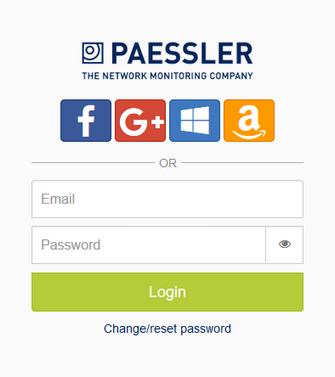 You can also access pages on the Paessler website from here, for information about the PRTG apps PRTG for iOS, PRTG for Android and PRTG for Windows Phone. These pages also contain the download links to the corresponding app stores. Only Google Chrome 57 or later (recommended) and Mozilla Firefox 52 or later are fully compatible with the Ajax web interface. For PRTG on demand instances, load the PRTG web interface with the domain you have registered at https://my-prtg.com and use the login method that you chose when signing up. To log in with your Facebook, Google+, Windows, or Amazon, click the respective button. A popup window appears where you can enter your credentials for the respective account. Alternatively, you can log in with the email and password that you chose when signing up. If you have received an invitation to PRTG on demand, click the link in the invitation and proceed to log in. If you cannot remember your PRTG on demand password, click the Change/reset password link. You are then asked to enter your email address. Click Change/reset password again and PRTG will send you an email to reset your password.